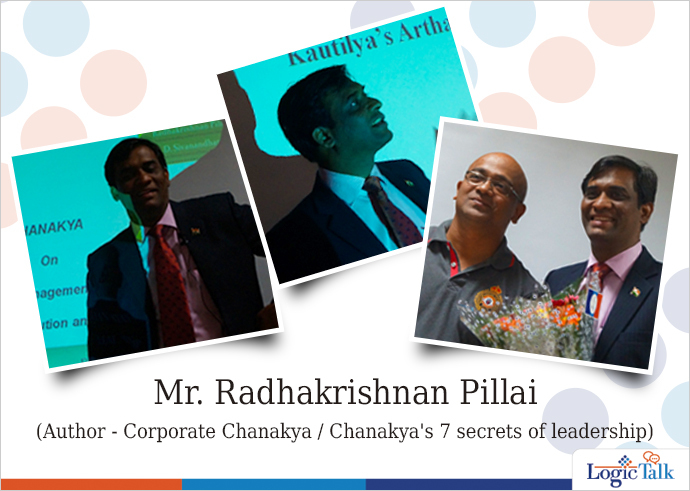 When Radhakrishnan Pillai stepped in for LogicTalk, the most important factor that struck most LogiMates was the ease with which he interacted with us. A popular figure and bestselling author of Corporate Chanakya, he shared his life experience and how India has motivated him on his journey for growth. As one of the inspiring figures among the youth of the nation, Mr. Pillai eased into a discussion on various aspects of India. He began with how the Indian Culture has survived the test of time and is leading the world in spirituality. He made LogiMates think on what is their road ahead for achieving success in lives. Alongside, through his life story, he not only highlighted the importance of self awareness but also the need to be a spiritually awakened person, for contributing to the country’s growth. These quotes have changed many of LogiMate’s perspective towards life and have been inspiring us in our journey; hope they do the same for you too. The talk began with understanding the importance of spirituality and this quote got LogiMates pondering over where they stand as a people. While taking a stand on spirituality do examine if it appeals with your sense of logic. This will make the path of your spiritual growth easier. One of the most important aspects of spiritual growth is to let everything to come to you. When the time is right, everything falls in place. One has to be serious and act up on the ideas and opportunities that come to them. If one doesn’t take the opportunities or ideas seriously, they won’t act on it. Eventually, the growth and success will become stagnant. He shared that once you are aware of your purpose; everything else will get streamlined based on the actions you undertake. The interaction left us on a contemplative note. I have noticed that among all the LogicTalks, self awareness has been a common thread. With self awareness we can rise to being a better version of ourselves. P.S: LogicTalk is a monthly event at Logicserve Digital wherein stalwarts are invited to interact amongst and motivate LogiMates. The topics discussed at LogicTalk encompass all facets of professional and personal life along with real experiences that have provided these stalwarts with visionary zeal to perform and attain their goals.